I adjusted the first post. So what do I have pictured in the first post? Is it relevant or no? The first post picture is the 6 inch figures so its relevant if they have been spotted but I'm not sure if they have been seen yet. The 6 inch figures that have been spotted are the "Rapid Revealers", not the Legends, so the picture is incorrect for now. Has anyone seen the GOTG Legends anywhere in Canada yet at mass retail (not comic stores)? I asked my regular dealer a while back to get a case for me, preferably in Canadian packaging. He just emailed me today and said he'd have to get it in US packaging. That usually only happens when HasCan doesn't bring a supply into Canada. So I'm thinking this wave might get skipped here. Just a heads up for those who really want it, might be a good idea to start looking at other outlets. But with the reveal at SDCC of a GOTG Legends 5-pack coming down the road, with classic comic versions of the team, that might be more worth holding out for! 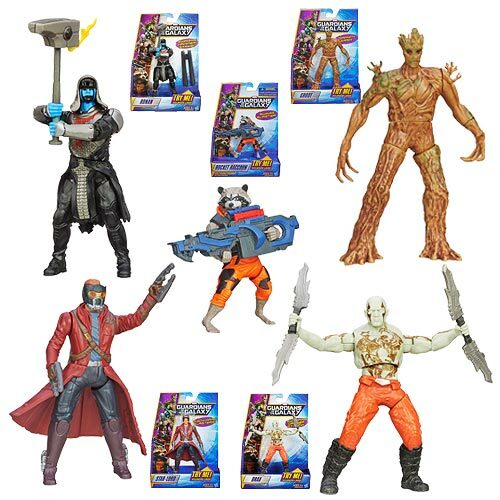 Toys R Us Canada has the GotG Marvel Legends on their website. Will probably be in stores after the movie release. The ones at Silver Snail did not have the Toys R Us sticker on them. Wait, what? Oh, I see them now... I was searching for Marvel Legends but they don't have "Legends" in the product name. Cool.